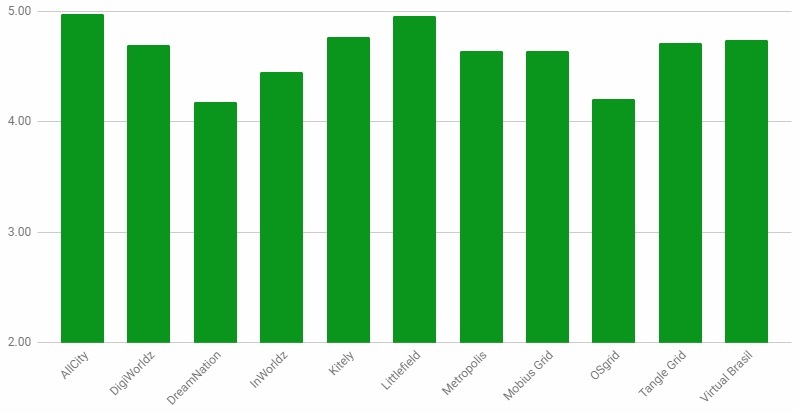 More than 400 responses came in for this year’s Seventh Annual OpenSim Grid Survey, and Littlefield received the highest overall scores, followed by AllCity, Virtual Brasil, and DigiWorldz. 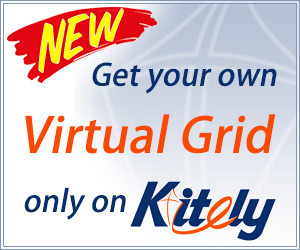 DigiWorldz also had the largest number of readers who said it was their primary grid, followed by Kitely. This is the second year in a row that InWorldz did not take the lead in the number of responses. People rated 40 different grids, of which 11 made it past the 10-rating-minimum cutoff point. 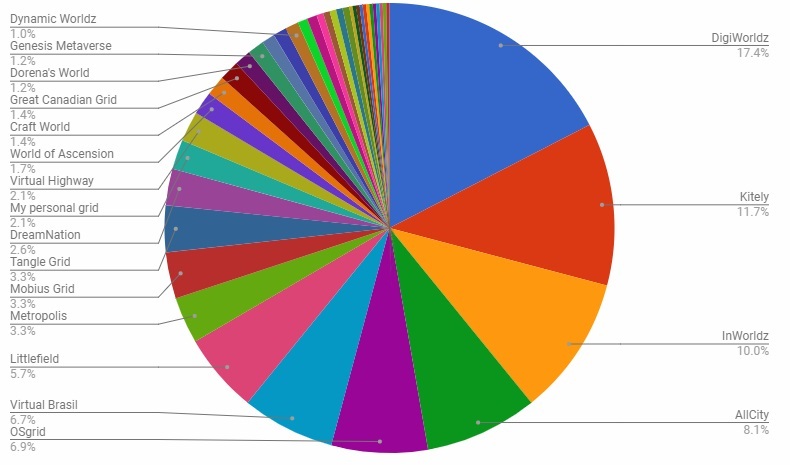 With about 300 public grids (see full list of active OpenSim grids here), we only list the most highly trafficked as the default options in the survey, but respondents are free to also write in any other grid they want. Each year, at least one write-in grid does extremely well in the poll. This year, that grid was Littlefield. Littlefield received a perfect score for support, and had the highest scores for technology and community. In content it scored a very close second to AllCity. However, the fact that it was not listed as a default option means that people who did not choose it as their home grid did not choose it as a grid they had visited, either. That means that Littlefield didn’t make the list of most-visited OpenSim grids — even though it may have been, but people just didn’t think of writing it in among all the grids they’ve ever been to. Littlefield is hypergrid-enabled, and does regularly hold events that are marketed to the broader OpenSim community, so it’s highly likely that this survey undercounts this grid’s total impact. 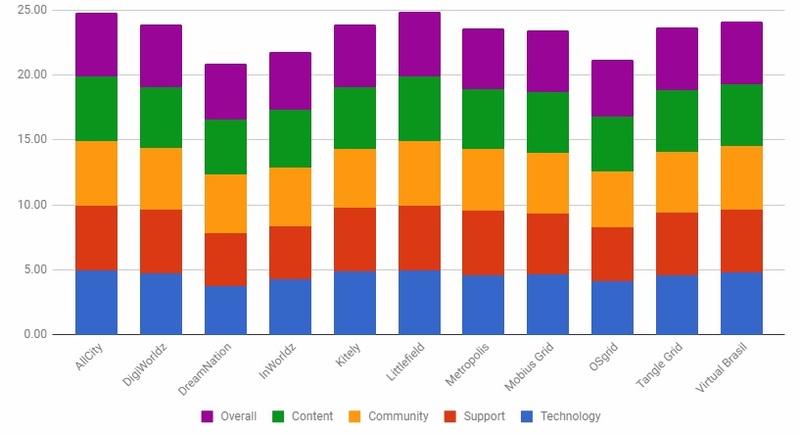 OSgrid scored the worst overall of all the grids, with the lowest score for community, second lowest for technology and content, and third lowest for support. 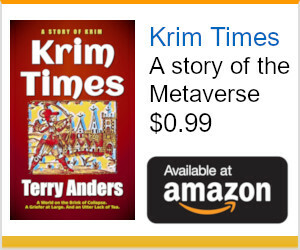 I suspect that the reason is because OSgrid is a non-profit grid, run by volunteers, and anyone can connect a region running on their personal computer. Self-connected regions, especially when running part-time on underpowered computers, can be problematic for residents. OSgrid is also the largest OpenSim grid by both land area and active users, which puts significant stress on both servers and support teams. Finally, OSgrid is the main testing ground for OpenSim, and runs the latest, bleeding-edge code. 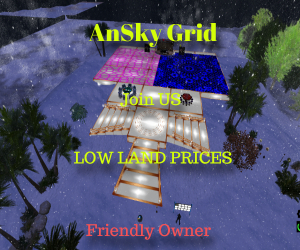 Testing out new features on a world the size of OSgrid is a great way to ensure that they’re stable enough for any other grid, but can negatively affect OSgrid residents. 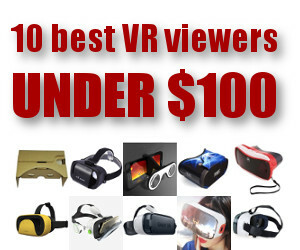 Meanwhile, OSgrid, in addition to being the largest grid, is also the most visited. 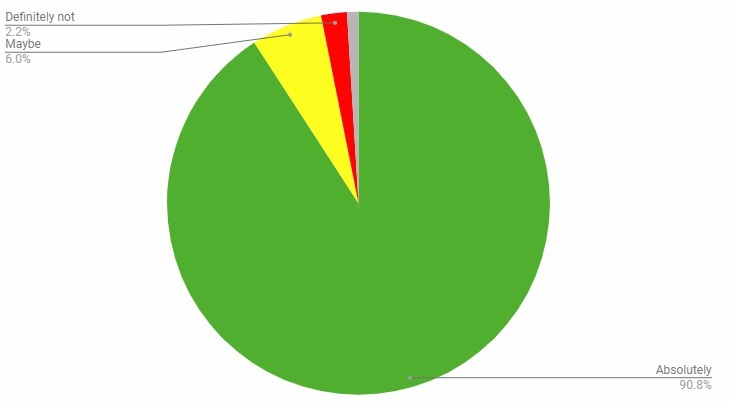 While only 29 percent of the respondents to this year’s survey said that OSgrid was their home grid, 74 percent had said they visited it. The grid’s welcome area, LBSA Plaza, is sometimes referred to as the “crossroads of the hypergrid” since there are usually people there, hanging out, helping other users, and answering general OpenSim questions for people from many different virtual worlds. 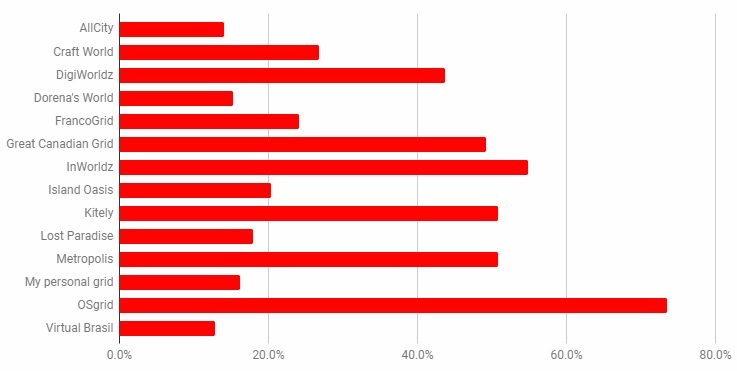 The following is a chart of the grids that were visited by at least 10 percent of our respondents. 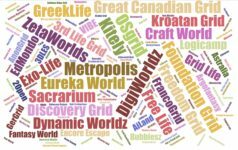 OSgrid has been visited by 74 percent of respondents, followed by InWorldz at 55 percent, and Kitely and Metropolis tied for third place with 51 percent each. 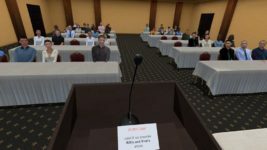 The number of people who had spent time on their own, personal OpenSim grid went up slightly from 15 percent last year to 16 percent. Another score that went up was whether people would recommend their grid to others. Last year, 89 percent of respondents say they would do so. This year, that percentage went up to 91 percent. Only 2 percent of respondents said that they would not recommend their OpenSim grid to others. 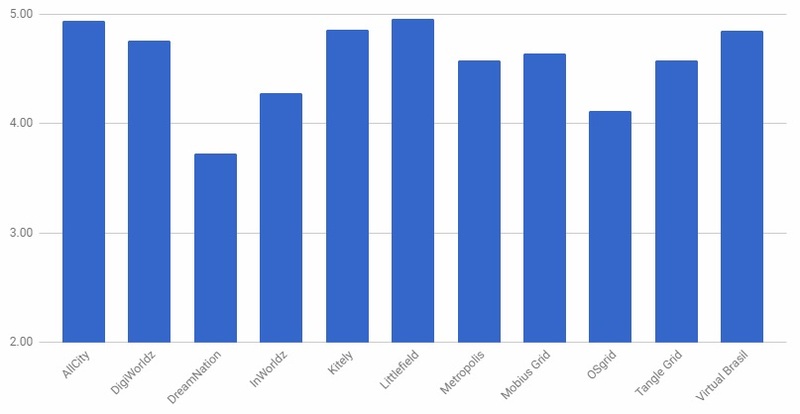 Littlefield, AllCity, Kitely and Virtual Brasil had the highest scores for technology, though none of them received a perfect rating. OpenSim grids tend to do very well with support since the owners and managers often have strong personal relationships with their user communities. The three grids with perfect scores — AllCity, Littlefield, and Metropolis — are known for their relationships with residents. “Very friendly support!” said a Metropolis resident. DreamNation and InWorldz tied for last place in support compared to the other grids. But these two grids, as well as each of the 11 grids that were ranked, had a “very good” or “excellent” overall score for this category. 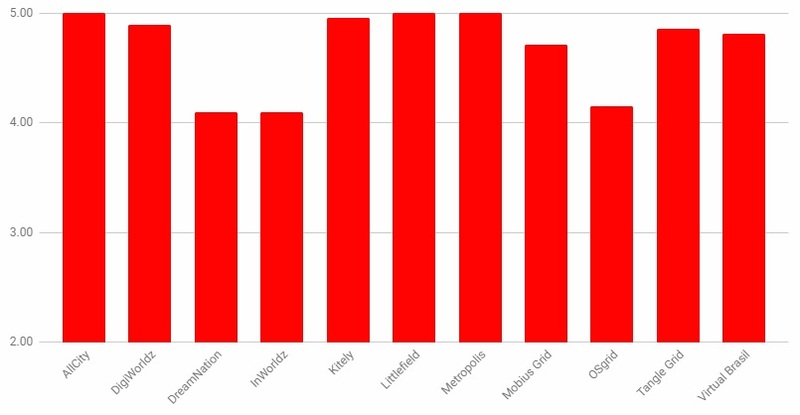 Littlefield was ranked highest for community, followed closely by AllCity. Littlefield is known for its community of specialized content creators. 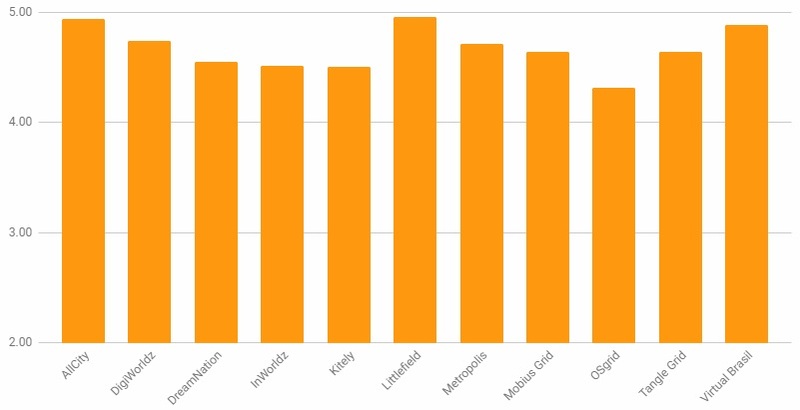 AllCity, a grid based in Brazil, got the best scores in content, closely followed by Littlefield. Kitely came in third, and several respondents mentioned the Kitely Market in their comments. 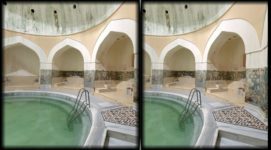 Next story Can VR stop sexual harrassment?